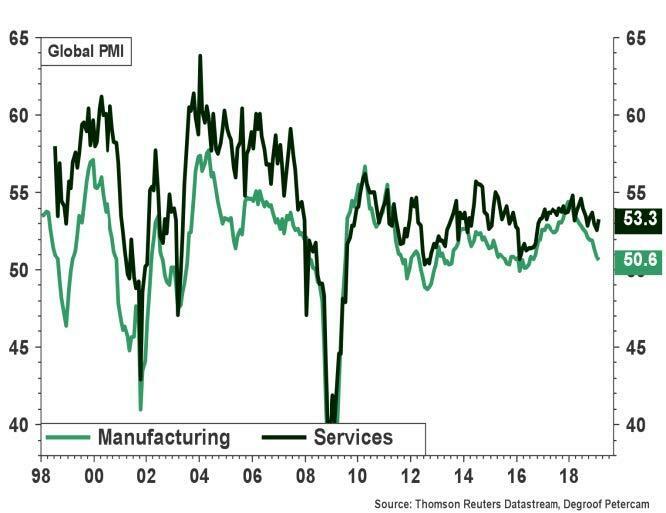 Global growth has fallen below 3% with confidence indicators still mostly pointing to sluggish economic activity ahead, especially in the manufacturing sector. 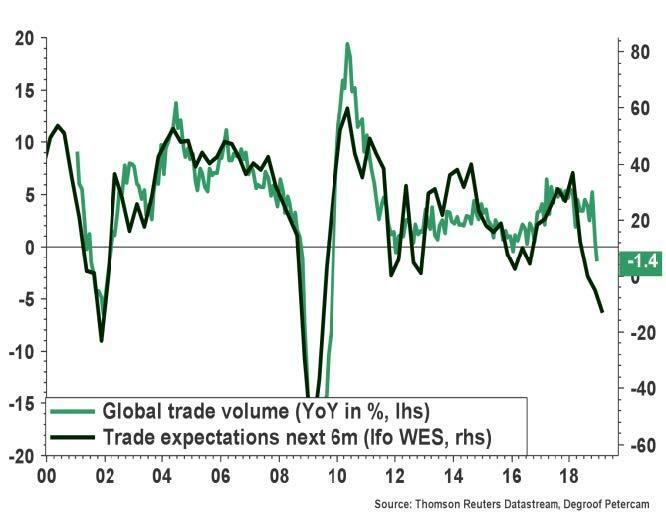 Meanwhile, growth in world trade volume has slipped into negative territory and risks are still skewed to the downside. What’s more, leading indicators suggest the outlook for investment has deteriorated sharply. At the same time, some elements provide a few glimmers of hope. These include more positive signals surrounding the trade talks between the US and China, central banks’ willingness to remain flexible, modest energy prices and the implementation of Chinese stimulus measures to arrest the ongoing slowdown. Headline inflation is still under pressure as a result of base effects linked to the evolution of energy prices. Core inflationary pressures, meanwhile, remain tame in general despite recent acceleration in wage growth. The upshot is that central banks are absolutely in no hurry to tighten monetary conditions. On the contrary, both their tone of voice and policy is turning more dovish. The US economy has fired on all cylinders over the past two years. Despite growth decelerating to 2.6% (QoQa in Q4), survey data remain pretty solid in general. Only 20K jobs were added in February, a disappointment. But this should be seen in perspective. The six month average number still stands at 190K, U6 unemployment dropped to 7.3% (from 8.1%) and average hourly earnings rose almost 3.5% yoy, the strongest in a decade. That said, growth in Q1 is likely to disappoint. Indeed, the Atlanta Fed GDP tracker only points to 0.5% (QoQa). 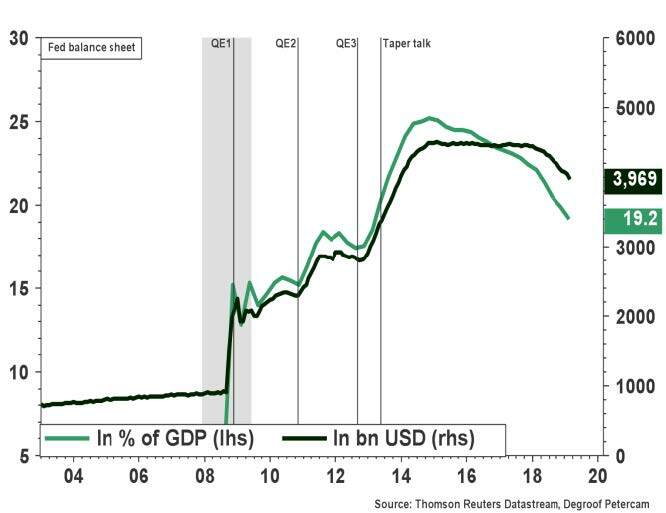 What’s more, the fading of the fiscal stimulus, the lagged effects of earlier rate hikes and a weaker external environment in combination with the strong USD suggest that growth looks set to weaken from here. Household consumption should continue to see decent growth for now as consumer confidence and real disposable income growth stay firm. 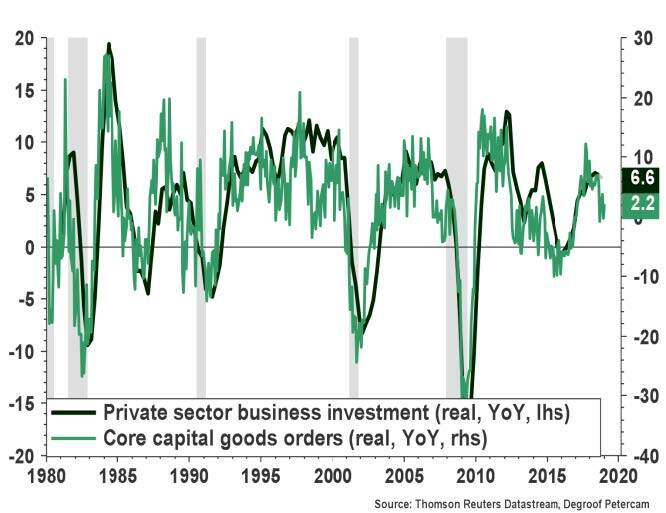 Investment looks set to weaken in line with the recent deceleration of core capital goods orders. Headline inflation will decrease substantially in the first half of 2019 while core inflationary pressures continue to hover around the Fed’s 2% target. The combination of lower anticipated future activity, modest inflation and volatility in financial markets has caused the Fed to become more cautious. In fact, over the last few months the Fed has taken a remarkable U-turn towards more ‘patience’. The Fed also provided more guidance on the rundown of its balance sheet which looks set to pause in the near future. The Eurozone economy has seen solid improvement in recent years. However, activity has weakened significantly over the last two quarters and prospects look rather bleak according to the latest confidence indicators. 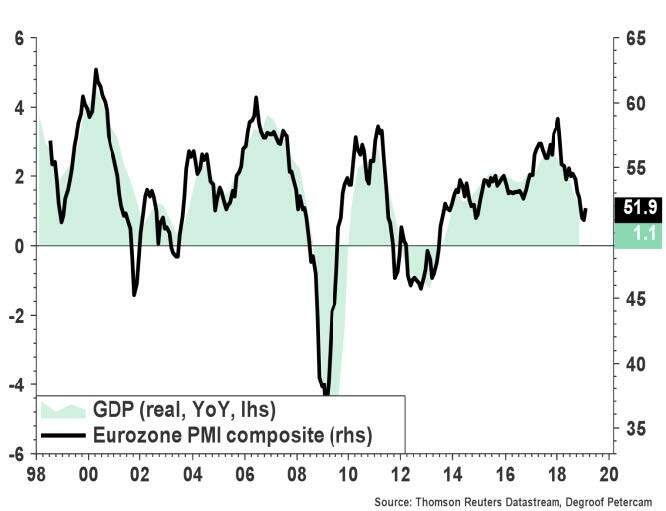 Both external and domestic factors lie behind the Eurozone slowdown. Industrial production growth has dropped into negative territory on the back of a slump in car manufacturing, weaker demand from China and ongoing political uncertainty. Meanwhile, the outlook for both investment and exports has quickly deteriorated. Consumer confidence has come down too, albeit from elevated levels. All in all, household consumption should hold up as the increase in real wage growth should help to support spending. The pick-up in wage growth also implies that underlying price pressures should move somewhat higher from here. That said, the 2% inflation target still looks very much out of reach. And inflation expectations have come down significantly recently (also on the back of base effects linked to the evolution of energy prices). 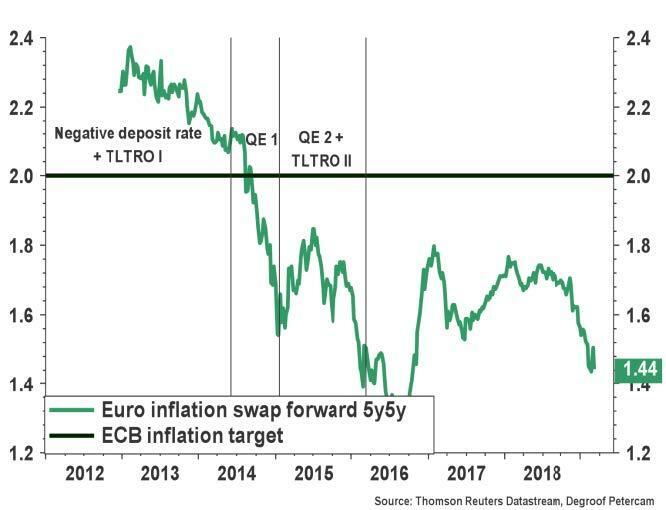 Logically, the combination of downbeat growth prospects and undershooting inflation figures has led the ECB to become much more cautious in recent months. As anticipated, in its latest policy meeting the ECB brought down its growth projections, postponed the timing of the first rate hike into 2020 (at the earliest), decided to strengthen its forward guidance while announcing more targeted long-term refinancing operations (TLTRO) for commercial banks. Italy remains a source of concern. Confidence in Italy has dropped significantly following the elections earlier this year and the budget dispute with the European Commission. Economic growth remains hugely disappointing. As such, without further structural and institutional progress both in Italy and the Eurozone, the country remains vulnerable to periods of self-fulfilling panic reactions in markets. Meanwhile, the Brexit saga drags on with no real definitive solution in sight for now as discussions between the UK and the EU go in overtime. All in all, we would stick to our base case scenario that a no-deal Brexit will be avoided. But whether this occurs through means of a second referendum, the UK staying member of the customs union or a modification of the backstop clause, remains difficult to say at this point in time. Indeed, uncertainty looms large. Get the full macro economic update here. 23.04.19 BNP Paribas: Nachhaltiges Investieren - so geht‘s!